As George Osborne, David Cameron, Boris Johnson, and the Bank of England’s Mark Carney rush to reassure the financial markets – the Pound, the FTSE, and the UK’s sovereign credit rating all dive. Sterling has been battered and remains at a 31-year low, the FTSE 250 has witnessed in as many days two of its top-five one-day losses, and S&P have trashed our credit outlook by two-notches, increasing borrowing for the Government and businesses. 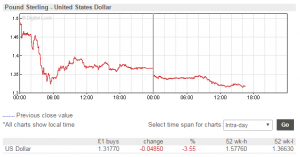 A second BoE reassurance on Tuesday 5 July caused the FTSE 250 and Pound to dive further. Was this just a two-day shock? 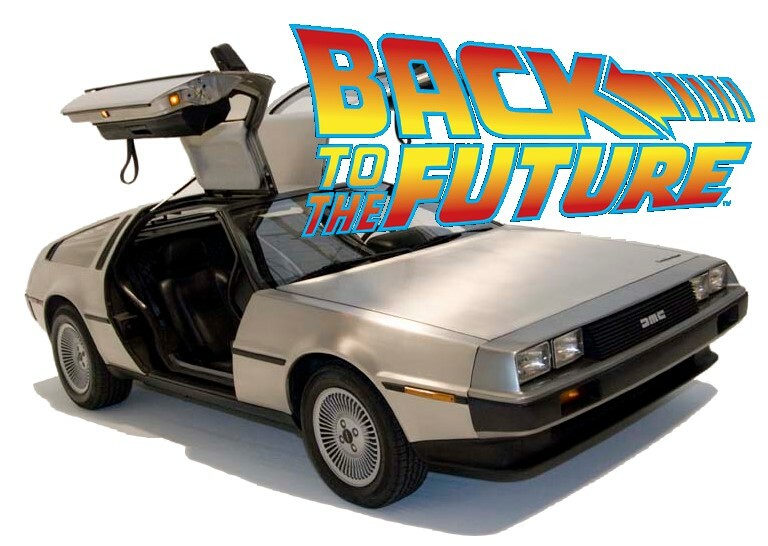 We haven’t seen all out financial Armageddon, but just what are we getting, and for how long? In the first hour of Tuesday’s trading the Pound was up just 1%, barely 1.5c higher after its 18c fall, but by 10.30am had lost half that gain already, only to regain it after lunch and lost most of it by 5pm. There has been no recovery against the € Euro. Perhaps, this was on hopes of a second referendum, called for by millions including Tory Health Secretary Jeremy Hunt, and Sir Richard Branson, despite being ruled out by the outgoing PM, David Cameron. 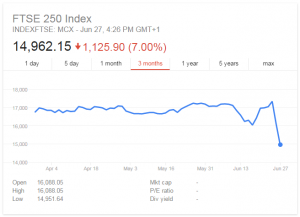 By Wednesday 29 June midday, the FTSE 100 had recovered all of its losses, whilst the FTSE 250 remained 10% down. It could be, too, that the market is recovering on the news that nothing will happen in the short term, that Brexit reality is delayed, and won’t kick-in properly till after Article 50 is actioned and up to 2 years later Exit terms agreed and then years worth, but some counts 5-10 years, of negotiating new trading terms with the EU and some 50 agreements with the rest of the world that were based on our membership of and access to the European Single Market. 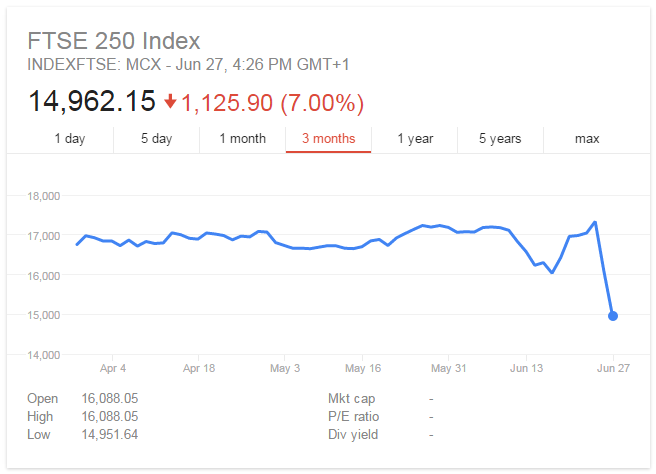 Thursday 30 June saw previous day gains restore the FTSE 100 to parity and by the close it was 2% above 23 June’s high. 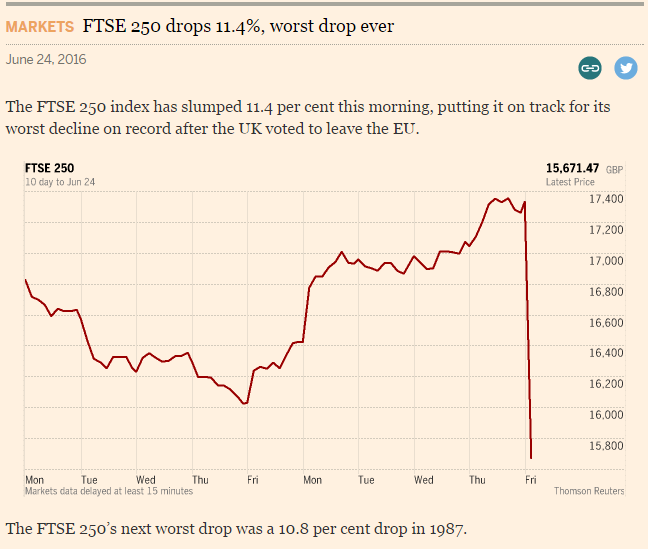 Whilst the more British based companies index, the FTSE 250, remains 7% down despite two more days of gains. It has gained 8.5% or 1300pts up on 14,967 since its low point on Monday. The Pound:Dollar exchange rate added 2%, lost 1% overnight, then made it back by lunch but after Mark Carney said financial easing might be required and Boris Johnson ruled himself out of the Conservative leadership, the Pound lost all the week’s gains, falling another 1.5% and remains 12% down. In a Radio 4 interview early this week, George Osborne repeated his claim that Brexit “would make Britain poorer” and lead to “an economic downturn”. Mark Carney had been accused of breaching the Bank of England‘s (BoE) independence by commenting quite forcefully pre-Referendum that Brexit might trigger recession. So, for him to say we are “resilient” now, is a little “flip-flop” but he did say that in the long term growth would be slower and the Bank could only “mitigate” against negative effects rather than resolve them. Mitigation includes the possible injection of £250bn. 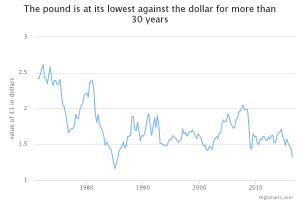 The £ Pound on Monday did not rally against the $ Dollar, instead, it continued its slide to around $1.31, nearly 13% off its 2016 peak to which it had risen on the short term belief that the UK would Remain. Instead, it has settled at its lowest level for 31 years, despite a 1% recovery on Tuesday morning. 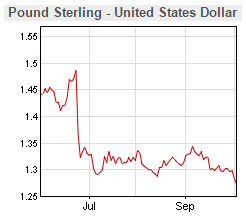 A week later, and by Wed 6 July Sterling dropped as low as $1.28 and is now hovering at $1.29, a 15% devaluation. 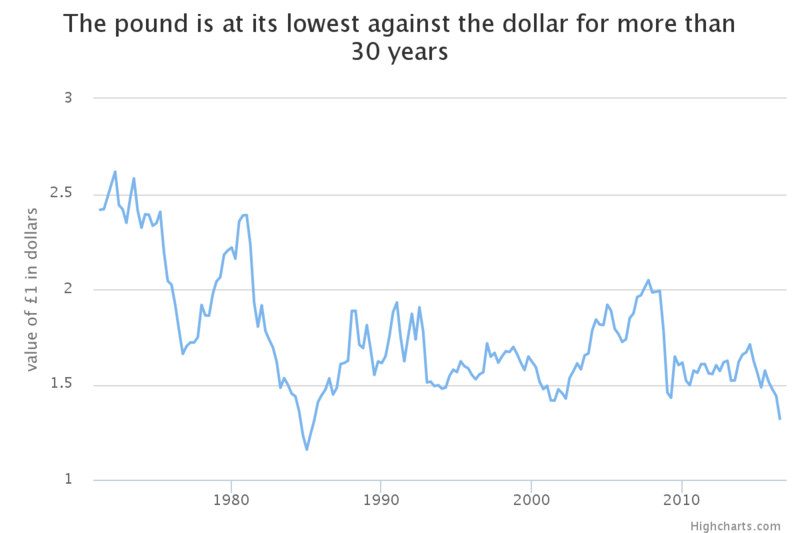 Sterling is predicted to fall further to around $1.15-$1.25, a 20-25% devaluation. This could add 15-20p to a gallon/3-5p a litre to the price of petrol within the month, as oil is priced in Dollars. There could be an 8% rise in food and drink prices imported from Europe since at €1.17 the Pound is 23% off its Euro peak and nearly 9% down since Thursday. 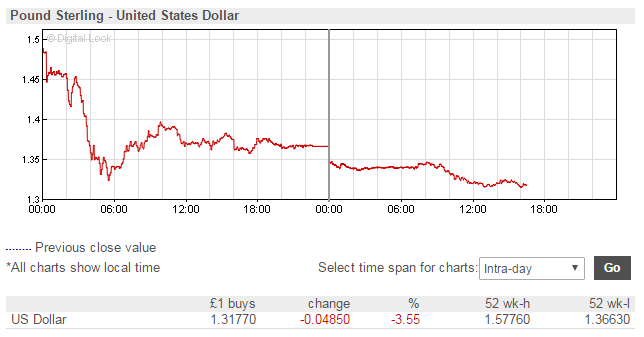 Some $2.5 trillion was wiped off global markets in hours after the Referendum result – between 100-400 years worth of the nobody-can-agree-on-the-actual-figure of UK contributions to the European Union. Seeing £100bn wiped off leading FTSE companies in 2 days is way more than the £350m a week (less than £10bn/year after rebates) supposed EU savings, i.e., equivalent to more than a decade’s worth of EU contributions. So no new money for the NHS then! Stock markets in the poor-performing economies of Europe, e.g., Greece, Italy and Spain, tumbled 12-15% on Friday, other world markets fell 3-8%. Italy announced a €40bn rescue of its banks after they lost a third of their value post-Brexit vote, despite a 5% bounceback they remain over 25% down since Thursday, June 23. A far better indicator than the FTSE 100, which has ‘only’ seen 2-3% daily falls since Brexit and a 2% recovery on Tuesday, is the FTSE 250. It is made up of more mid-size predominantly British companies with 50-70% UK-based trade – the powerhouse of employment in the UK. Some 75% of Small and Medium Enterprises (SMEs) voted Remain. 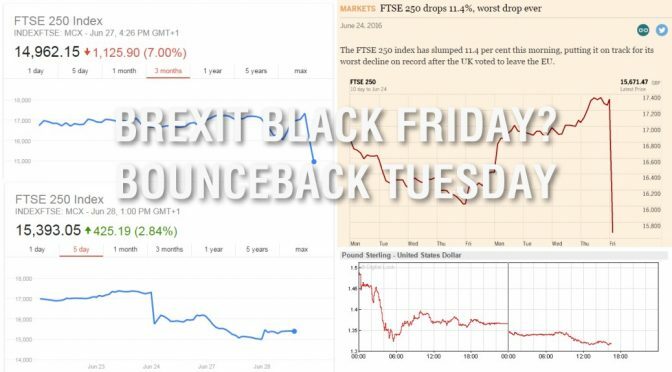 The FTSE 250 has lost over 14% since Thursday’s vote, reaching 7% late-afternoon, continuing its near-8% slide last Friday when, at its worst, it dropped 14% in hours – its “worst drop ever”. 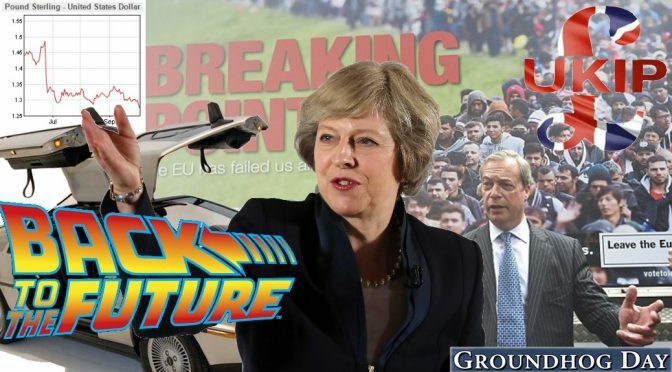 It’s nearly 20% off its peak due to Brexit uncertainty over the last few months, its worst crash since 1987. During the 2008 crash, over a number of months, it lost nearly half its value leading to lay-offs. recession and austerity. 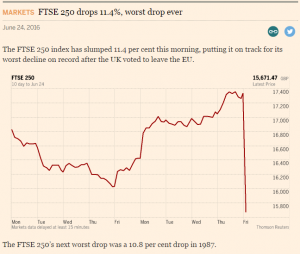 The FTSE 350 lost £140bn in a day, recovered, lost it all again by 4.30pm Monday but has now recovered 5% from its 7% loss. Banks (domestic and foreign) in Britain have been told by EU members France and Netherlands that they will not be able to use the European financial ‘single passport’ access to unhindered trading resulting in additional banking costs and a reduced incentive for US and Asian banks to be based in the UK – Dublin, Frankfurt and Paris, are suddenly more attractive and expected to gain financial jobs from the City of London. Barclays and Royal Bank of Scotland (RBS) have lost 35% in value since Thursday and had their shares temporarily suspended on Monday. On Tuesday there was around a 5% recovery. Whilst many 99%-ers on the Left might celebrate another banking collapse, those businesses that employ millions depend upon a stable lending banking system to finance their growth and pay wages. 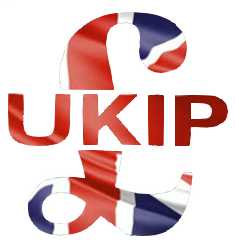 The costs of imported raw materials, food, wine, petrol etc could rise 10% because of the Pound’s fall alone. If British businesses selling at home want to keep prices the same, they will have to cut back office costs and jobs instead. Yes, we will recover, but book a “one-way ticket”, to quote George Osborne, for more austerity, unemployment and inflation pain first. House prices may fall in the short term according to Savills but so will affordability, mortgages, and lending criteria stress tests may rise. International buyers may take advantage of a cheaper Pound to buy here, whilst locals are priced out of the mid-market. House builders have seen significant share price falls and the FTSE triggered its ‘circuit-breaker’ to suspend trading in all house builders temporarily. For instance, Taylor Wimpey fell 16% (40% since Thursday), Persimmon 17.4% (38% in 2 days) and Barratt Developments fell almost 20.7% (38.4% in 2 days), Bovis Homes 33% in 2 day etc. In addition, with the credit rating trashing they will find it harder to fund new building developments, further intensifying our domestic housing crisis. Radio 4’s You and Yours is reporting people seeing immediate 5% drops in house sale prices due to Brexit – ‘Brexundering’. We could eventually see a quadruple-whammy of wage restraint, credit crunch, inflation and interest rate rises, affecting house buyers and stifling the pressured renting sector too. It has been reported that particularly those living abroad may lose UK annual increases with inflation to their pensions, but also those at home might lose the “triple lock” guarantee. Pension funds held privately on the stock market will obviously go up and down with the fortunes of the FTSE, currently down. Of course, Leave leader, Boris Johnson said pensions would be unaffected, he also said the NHS would get £350m a week and that among many pseudo-promises has already been pulled. A survey of 1,000 directors at the weekend reveals that roughly 20% are expecting to issue redundancies, over 20% are freezing recruitment, and 20% considering moving some operations to Europe. A former Organisation for Economic Cooperation and Development (OECD) economist has warned that the UK faces its worst economic crisis since the Second World War. It is certainly on track to challenge 2008’s banking crisis and 1987’s Black Monday crashes which saw £63bn wiped out. 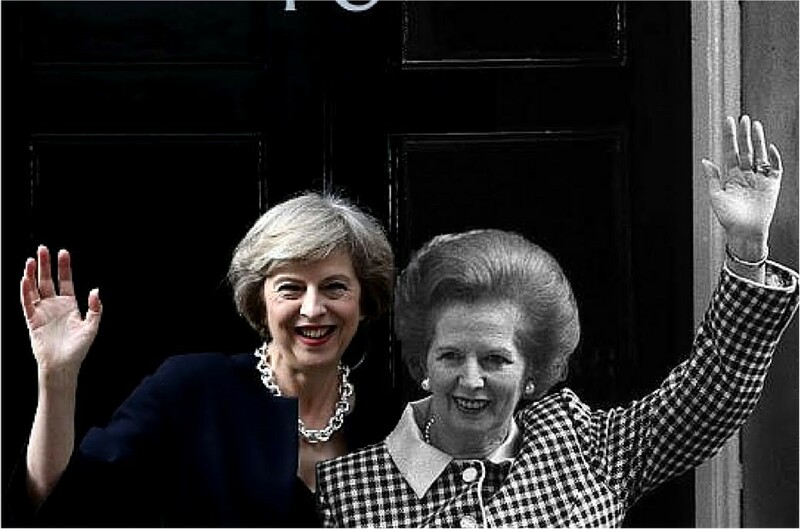 Other crises include the 1974 General Election which saw one-day losses of 7.1%. Back in 1929 the Dow Jones witnessed a 22.5% drop in a single day. Yes, we will weather it, and in the long term it may make little difference, but the short-medium term is going to be harder. We still have to pay into the EU budget, but will begin to be shut out of meetings and decisions, we will still have freedom of movement and migration for EU citizens for at least 2 years, if not beyond if we follow the likely Norway or Swiss models. It is highly unlikely the EU will allow us the Canadian model, indeed Angela Merkel said today that the UK would have to accept freedom of movement. The EU do not want to encourage other exits. Many are trying to find legal ways to vote out of the Referendum result.